Whenever the conversation turns to marriage proposals, I have to share the story of my friends Lori and Matthew which entails a Kinder Surprise Egg. 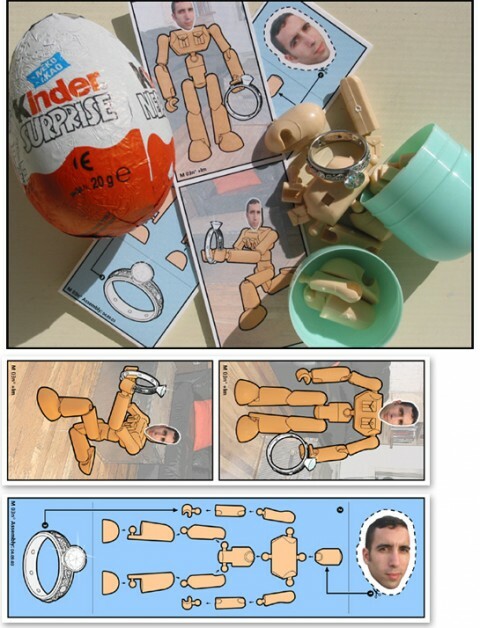 Matthew painstakingly took apart the chocolate egg and replaced the toy inside with a small robot figure and illustrated instructions on how to assemble him into a tiny MatthewBot on bended knee. Also inside was the ring! He then reassembled and rewrapped the egg to look virtually untouched. Fabulous, right? I did similar last valentines day – had to use an hot scalpel to get the egg open and melt it back together. This is a beautiful, creative, amazing proposal. as long as she didn’t eat the ring! This is amazing! Kinder Eggs used to be my favorite. We spent 3 weeks in Europe this past summer, mostly in Germany, with the kids and we looked all over for them. Did not find them anywhere! Does anyone know if they stopped making them with the toys inside? I’ve never been to Germany, so can’t speak for them, but importing Kinder Surprise is illegal in the US. I think it has to do with small toy pieces. Anyway, they do still make them. Importing Kinder Surprise is illegal in the US? Man they must really love their children over there and will go to any length to protect them…except if it negates their right to carry guns!!! Idiots. I haven’t seen them in Chicago for quite some time, but apparently you can still find them if you look hard enough. What a great and cute idea. Three surprises to say yes to. Awesome idea. Where did you get the little proposing figure from? Wonderful story! We are working hard to fight the ban in the USA. We would love to spread the word. The site is freetheegg . com I don’t want to put them together in case anyone thinks we aren’t legit. :) FREE THE EGG!! That’s an awesome idea! Did he make the figurine? Is there a way I can find something like that?